to continual improvement in aerospace quality. 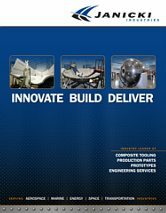 January 2, 2013, Sedro-Woolley, WA – Janicki Industries has received Nadcap Composites accreditation for its Hamilton, WA facility. Janicki received Nadcap accreditation by passing a rigorous audit that demonstrated its ongoing commitment to quality that satisfies customer requirements and industry specifications. Nadcap is administered by the not-for-profit Performance Review Institute. PRI develops performance standards and administers quality assurance, accreditation, and certification programs. “Achieving Nadcap accreditation is not easy: it is one of the ways in which the aerospace industry identifies those who excel at manufacturing quality product through superior special processes,” said Joe Pinto, Vice President and Chief Operating Officer at the Performance Review Institute. This entry was posted in Press Releases on January 2, 2013 by fdgadmin.